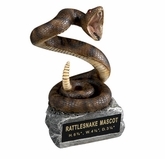 Item Description: Modeled three dimensional resin painted mascot trophy. 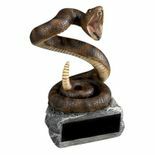 Height: 6-3/4, Width: 4-1/4, Depth: 3-1/4 (inches). This item is supplied with a 3 x 1 inch black screened laser engrave-able plate.